I took this picture just outside of the sliding glass door to my bedroom. This caterpillar is really creepy. I wouldn't want to be stung by it's scary spines. It has a cousin in Argentina that has such a fierce sting that the people it stings go insane from the pain. Be cautious when you're out climbing trees curculio. We want you back here as sane as you were when you left. I didn't realize that caterpillars sting. Does this one sting, or only its Argentinian cousin? Lots of caterpillars sting. If it has bristles or hairs, don't touch it. Check out http://www.ca.uky.edu/entomology/entfacts/ef003.asp for some pictures. The worst one around here is the cute little fuzzy puss caterpillar, aka the stinging asp. See http://hortipm.tamu.edu/pestprofiles/chewing/asp/asp.html for info. It's so cute, you just want to pick it up and pet it. But hidden in its fur are stingers that can make you hurt worse than a Texas scorpion sting. What does it turn into? Can the spines pierce gloves? I don't know and I don't know. Well, I won't list everything that has stung me, but I would have to rate Arilus cristatus, the wheel bug, as my greatest pain in the field. I picked one up to show someone at a rest area, knowing full well they could bite and thinking I had it in a "safe" position, when it nailed me on the thumb. It caused intense, burning pain for about 4 hours, and then a tingly, bruised feeling for another 2 days." A Wheel Bug for Ahura's sake! And they are so friendly looking. Maybe the stuff of dreams? This is kind of nice. I believe that the scary critter your photo is the caterpillar of a Question Mark butterfly. I don't think it stings, but I'm not sure. Also: [This is regarding the Saddleback caterpillar, NOT the Question Mark.] "... The sting from the spines on the body of the caterpillar is painfully unforgettable. This is a great caterpillar to examine in the landscape but avoid physical contact unless you have latex gloves or some other type of protective gloves...."
It looks like you are right! Thankyouthankyouthankyou. I am labeling this guy as a Question Mark Caterpillar. 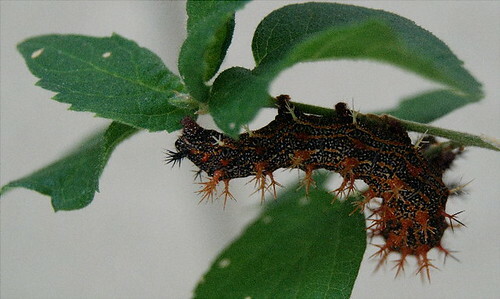 I have two trustworthy sources with caterpillars that look like mine, http://bugguide.net/node/view/6988 and http://www.biosurvey.ou.edu/okwild/misc/qmark.html. So maybe this guy turned into FlutterButter. I'll use a flickr site to help me start IDing something. But unless I know the person posting is an expert in that area, I'll only use their photos as a starting place. I then look for verification of the ID on bugguide.net or a .edu site. That being said, I already used one of junesbugs' pictures flickr site to ID a picture I took of a Black Swallowtail Butterfly Caterpillar. It looks like junesbugs' Flickr site is going to be a good resource. Thanks. It looks like it's on hackberry leaves, which would fit with a Question Mark, except that nearly all its spines are orange. The Question Mark is a very pretty butterfly that comes in two (seasonal) color patterns...I have trouble remembering which is which. One brood is all orange (both pairs of wings) with dark spots; the other has orange wings with dark markings in front and dark (brown or black) hind wings. I wouldn't touch it either, but then I figure that if catepillars have hairs or spines, it's for defense against all those voracious birds that think caterpillars are delicious. The puss caterpillar, which we called "asp" when I was a kid in South Texas, is the one that I remember causing the most pain...it was like having a hot iron laid on your skin. Until cdozo moved to TX. I did not know that caterpillars could sting. While looking up this guy, I saw pictures of the asp caterpillars and they look like My Little Pony caterpillars, like they should come with a glittery pink comb. What a mean caterpillar trick.